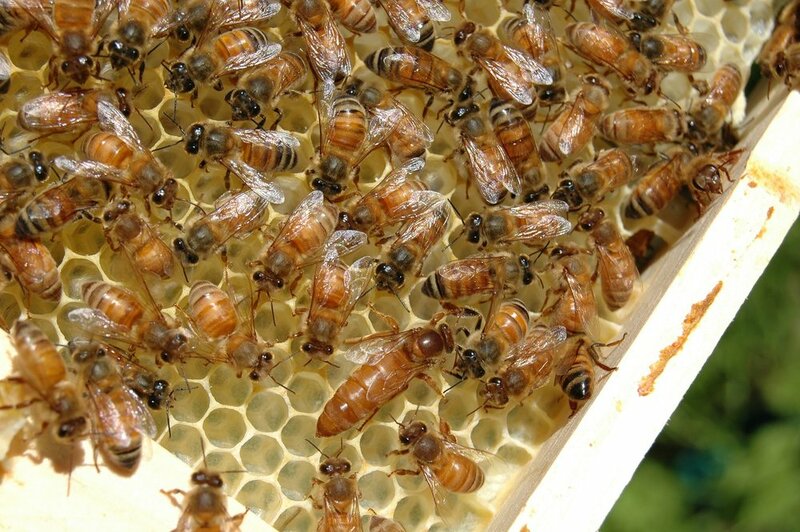 An essential part of beekeeping is understanding swarming behavior including when, how, and why honey bees swarm. It's important to learn to work with your bees natural tendency to swarm and to understand how to manage bees (a "beekeeper") rather than being caught off-guard and losing your hard work and resources to the wind (a "beehaver" as Mel Disselkoen says). For those on this blog interested in the On The Spot ("OTS") method and reading Mel Disselkoen's book, "OTS Queen Rearing", you likely understand the importance of planning around the first swarm date in anticipation of an artificial swarm and queen rearing. Part 1 of this 3-part series "Swarm Prevention with OTS Queen Rearing" will explain this more in detail. Part 3 will talk about "Successful Honey Production Using OTS Queen Rearing". This particular post attempts to give you some helpful clues to nail down when bees typically swarm in your area and give you confidence about choosing a date to artificial swarm and notch your colony. There is no specific date bees will swarm. ― A good beekeeper learns to observe and understand the great variability in bees and weather that influence this date year to year. There is a great difference of opinion on determining a date and swarming in general. ― When you ask, you're bound to hear divergent views. Don't let this discourage you. Take notes and let the info help frame your learning and decisions. It may take a couple years or more to really get a feel for your area. ― You may find that information is limited or conflicting and require your own testing and deductive processes. Experience is the most helpful teacher. ― Ultimately, what happens in your backyard with your hives as you progress through a couple seasons will be the best lesson, as long as you observe and keep notes for the future. Have a goal to nail down a typical 2-week window for your specific location. You'll be hard-pressed, as mentioned, to actually come up with a specific date each year. It's never the same and, in some areas, there are drastic differences. However, you need a benchmark to help you lay over the other variables such as weather. Get a log book (I carry a moleskin and pen in my pocket almost all the time) and be determined to take notes. Talk to the closest bee supply store and ask what dates they use. You'll get some variance, but that's okay ― write it down. "2 weeks after first apple bloom"
"20 days after dandelion blooms"
Visit a local bee club meeting (closest one to you) and ask "old-timers" what they think. Try and get information from beekeepers who've been at it for a couple decades or more. Write down those dates. Pay special attention to beeks who love chasing down swarms each year. It's in their best interest to get their swarm traps out each year at least a week or so before swarming begins. Write down those dates. Start following beekeeping groups and Craigslist in your locale and take note of when ads start showing up and when swarms start being discussed. Write down those dates. Start watching the weather well before, during, and after swarm season and take note what the weather patterns were just before and during the beginning of swarm season. You'll learn a lot. I also like to check on historical data for my zip using TimeandDate.com (ex: https://www.timeanddate.com/weather/usa/cleveland/historic?month=5&year=2015 ). (By the way, a helpful tool to find your latitude can be found here: https://mynasadata.larc.nasa.gov/latitudelongitude-finder/) It's intriguing to see both similarities and differences year-over-year. You want to wait as long as possible, without taking too much risk. You want as much brood build-up with the existing queens before you artificial swarm, but not wait so long that they initiate swarm behavior and you lose your window. Plan for doing your OTS artificial swarm and notching at the beginning of that window. Watch the weather a week before that date. If there is some drastic downturn to colder and/or stormy overcast weather, you can wait some time. Of course, do a check of your bees a week before artificial swarm to make sure you're not caught off-guard. I trust this helps and gets you started with confidence. As the years progress with your beekeeping, you'll more intuitively understand the ebb and flow of swarming in your apiary and how to understand what signs the weather and bee behavior afford with your decision-making.